Shark diving in South Africa has become extremely popular and people visiting the country flock to towns like Gansbaai and False Bay to experience this amazing activity. Some sharks are more dangerous than others and it’s good to have some knowledge on what to expect from these predators. This amazing animal is enormous, powerful and feared by many, making the Great White Shark very popular to dive with. 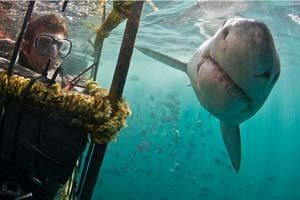 As they are tremendously dangerous you have no other choice but to dive with these sharks while safely in a cage. Extreme adventure seekers can dive with these sharks in the town of Gansbaai or in False Bay which is close to the city of Cape Town. With its sleek and beautifully slender body, an indigo-blue topside, bright blue sides and a white underside it’s no surprise that the Blue Shark is claimed as the most beautiful shark in the ocean. This gorgeous shark is an excellent scavenger and can easily travel several thousand kilometres in just a few weeks. They pose moderate risk to humans as most humans dive with them without any incidents, but they have been known to give small bites when they get excited. This amazing shark can switch from salt water to fresh water and has been found as far as 2000 miles upstream in massive rivers. These relatively large sharks are said to be one of the top four breeds of sharks which are responsible for attacks on humans – therefore diving with them takes place in cages. They are identified by their beautiful silver-grey back, white underside and short noses; they are truly remarkably gorgeous and a special experience to dive with. These sharks are the quickest species of sharks and have the ability to leap up to 20 feet above the water. Mako Sharks look extremely aggressive and have conical snouts, long gill slits with short pectoral fins and crescent shaped fins. They are potentially dangerous, especially if you’re not in a cage, but the smaller sharks don’t pose a great threat to divers. Mature sharks on the other hand are fast and sharp and cage diving is a safer option. There are many sharks with which you can have an amazing shark diving experience whether it is in a cage or not. South Africa offers amazing diving opportunities for visitors and for locals wanting to experience this extreme adventure. There’s nothing like experiencing the thrill of cage diving in Gansbaai or False Bay.